Other Information on water tanks. Some frequently asked questions that we get asked about drinking water tanks & tank water. See how you go answering them !? If you would like to know more, contact me via this website or call me on 0428 594 565 or email me on info@watertankcleaning.com.au The answers can be found by going to www.tankcleaning.com.au and open "Clean Water" page then click on "Frequently asked questions"
A-Why does our water taste & smell bad at certain times of the year ? B-Why is it that the hot water smells even worse than the cold water; so much so that we can`t even have a shower; we come out smelling worse than before we went in ? C-We have the finest & best filters; why isn`t our water quality better ? D-Some members of the family develop upset stomachs, mainly during summer, for no apparent reason, why ? E-Is it true that tank water is better/safer than town water ? We were told it is. F-We have an open concrete tank. How can we get rid of the algae that makes the water green looking ? G-Our water pressure seems to be lower than it used to be. Why ? H-My water pump keeps starting & stopping. Why ? I-The cold water flows into the washing machine at a trickle. It was much faster in the past! Why is this ? J-My tank doesn`t seem to be filling up. How can I tell if water is getting from the gutters into the tank ? K-Do we need to clean our tank ? We thought all the muck stayed in the pipes that go underground to the tank ? L-How often should we clean our tank ? M-My water pump starts as soon as a tap is turned on. It used to take a while to start in the past. Why is this ? N-My electricity bill seems to be dearer than it was. Is there a reason for this ? O-If I find a dead animal or bird in my tank what do I do ? Must I empty out the water ? P-This morning a live earth worm came out of our kitchen tap! How is this possible ? 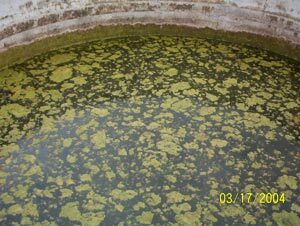 Q-We had to get water delivered as the tank was low & now its all stirred up & the waters coming out really dirty. What can I do to clear it up ? Did the water carter give me a bad batch of water ? R-We have mosquitoe larvae in our tank water. We can see them in a glass of water when we run water from the tap. Can we do anything to get rid of them ? S-Our tank has this large 50mm (2") thick floating algae mat that wasn`t there last week. Where did it come from ? T-Why are my bactoscan readings still too high even after I`ve cleaned all the equipment & replaced the rubberware ? U-Why do concrete tanks crack ? How were you able to tell me where my tank was cracked without seeing it ? V-How can I check if my tank is leaking ? We seem to be losing water & it never gets full. 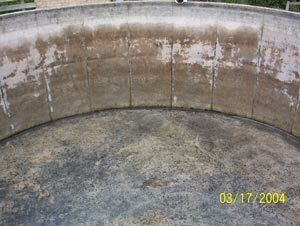 W-Can you repair wall & base cracks in a concrete water tank ? If so, how ? X-My water is smelling very off. Why did you ask me if the pest control man was here ? The fact is he was here last week! Y-Why does the water in my plastic tank smell every year in summer but the concrete lidded tank water is fine ? Z-My water stinks. Is there something that I can put in it to get rid of the stink ? Z2-We had our tank which had some wall cracks fixed from the outside with a product that went as hard as concrete but now its leaking again after a year ! Why is this & what should I do now ? Z3-We have a brand new concrete water tank that has just had its first lot of water go in. The water tastes terrible !! Why is this ? What can I do ? -How can I make my tap water taste less like swimming pool water ?? Don`t laugh, there is a way ! If you are interested in the answers let me know as I was thinking about putting them somewhere else on this website or supplying an answer sheet which I could send out. Kind regards, Adam. Farmers, what about those tanks that supply your water for cleaning out the lines & vats in dairy sheds for milk production? Our Biochemists analysis confirms that algae & bacteria in your water can affect your milk quality, so a once a year clean to your dairy tank can help keep algae & bacteria levels under control giving you greater returns due to excellent milk quality. The Watertank Cleaning Co. has achieved remarkable results in the improvement of water quality and subsequent improvement in the quality of milk at the farmers vat. We have details of a farmer having a bactoscan reading of 421,000 which dropped to 19,000 after having his open dairy tank cleaned by us. The quality of milk improved from Band 4 to Band 1. The results were a great result for everyone; The farmer received much higher revenue for his milk; the milk company received better quality milk and we obtained many more clients via the best form of advertising - "word of mouth"!